You know those brands that you use a whole handful of products from, but never really hear much about? I decided it was high time I shared a couple of those, the products I use and why I love them. Maybe you'll discover a new favourite brand! Today I'm looking at the Botanics range at Boots, which is a really affordable range and there are often offers running taking the prices to absolute bargain levels. I'm currently using seven of their products, mainly from the All Bright range, which aims to counteract dull congested skin. Botanics All Bright Micellar 3 in 1 Cleansing Solution | £2.99 here | I use this as my first cleanse of an evening to remove the bulk of my make-up before I go in with a cleansing oil; it seems to do a really good job and it's nice to see just how much gunk and grime comes away on the cotton pad each night. Botanics All Bright Cleansing Toner | £3.99 here | I have reviewed this product in full if you'd like more details, but suffice to say I absolutely love it; it's my evening toner of choice, containing AHAs which act as chemical exfoliants to helps smooth and brighten the skin without the harshness of manual exfoliants. This is a fab budget-friendly door into exfoliating toners and I honestly don't see myself purchasing anything more expensive when this has been so effective for me. Botanics All Bright Soothing Eye Make-Up Remover | £3.99 here | This is a bi-phase formula which you shake to activate, and I've found it really effective in gently removing my eye make-up; the oil part of the formula means it lifts away even waterproof mascara without too much hassle. I tend to just hold a cotton pad soaked in remover over my (closed!) eye for around ten seconds, before gently wiping away. Botanics All Bright Purifying Face Scrub | £3.99 here | I use this every second or third day in the shower; it has quite a similar consistency to the St Ives scrubs so requires a light hand to apply it, and I tend to concentrate on the more congested areas around my nose and chin, but it does work pretty nicely to leave my skin feeling softer and smoother. Botanics Organic Facial Oil | £9.99 (no longer available) | I've actually reviewed this in full as well, so do click through if you'd like to read more about the product. In short, though, I tend to use this most evenings before I apply my moisturiser just to give my skin a little helping hand. I do have oily skin and I haven't noticed and increase in oiliness or blemishes from using this, so if you have oily skin and have been scared to use an oil, this is a budget-friendly way to give it a try and I'd really recommend picking it up! Botanics All Bright Cleansing Foam Wash | £3.99 here | I keep this at my boyfriend's for when I stay over, so I don't have to cart all my skincare and toiletries back and forth. This gets used both morning and evening when I'm there; I use it twice in the evening, firstly just massaging in and rinsing well to remove the bulk of my make-up, and then repeating and removing with a warm flannel to ensure my skin in properly clean. In the morning I just use it once, massaging in and rinsing, often in the shower. It works well for me and smells gorgeous! Botanics Shine Away Invigorating Face Scrub | £2.69 (no longer available) | This also lives at my boyfriend's so I only use it a couple of times per week; it smells lovely and has a really nice, fine texture which leaves my skin feeling soft and smooth but doesn't cause any irritation. I wouldn't like to comment on the mattifying claims as I don't think I use it consistently enough, but it would be an added bonus if it helps keep oiliness under control! 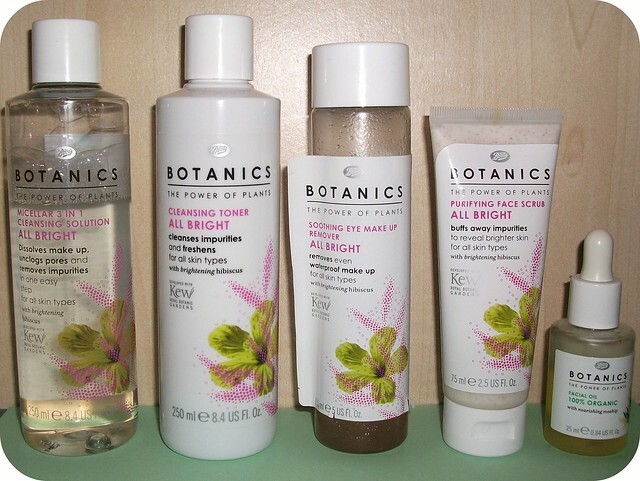 So, those are the Botanics products which currently feature in my skincare routine! As you can see, I use quite a few products and have had good experience with them all; I'd definitely recommend the range as an affordable option which should offer something for most people, including dry skins, oily skins, anti-aging, and the brightening products I use. Have you used any Botanics products? Are there any other products from the range you'd recommend I try? I agree that this range has some great products! I used that tonner and the night cream and I liked it but I didn't so much the micellar water, it stings my eyes. Now I'm using the rose water spray in the mornings and I love it! I have to admit, it isn't a brand I am familiar with or used. I haven't heard or seen this brand before, will have to look at them next time I'm out. I used to use Botanics years ago but they stopped making a product I really liked (can't even remember what it was now!) so I stopped using them in protest :) I should probably give them another go now ! Wow, I have heard of this brand but I don't think I've tried them. What a great line. I love this brand :) It deserves more hype! I think Botanics is easily overlooked which is a shame as they do have a few nice products. I do wish however that they hadn't changed some of the formulas as I know for definite that their moisturiser I used to use all of the time has changed, it no longer works for me sadly.